Once again, the redemption of those who were taken from Ziklag happened on the third day (v.1), where David by the indication of the priest Abiathar and ephod (v.7) received command from the LORD to pursue the Amalekite band. David in his distress, in his weeping, is immediately seen as the weak and humble king-to-be – in contrast to Saul who has not wept nor has he truly inquired of the LORD except through a false mediator who attempted to raise Samuel from the dead. This is the Saul who has caused his men hunger. The Saul who has led people to war without inquiry from Samuel. The Saul whose kingdom was torn from him as the Father elects Christ to be the only true anointed One, He who weeps for His people (Isaiah 63:10) and would not move until the Father commands Him to move. So here, David equally is not first and foremost portrayed as a man of valour; and time and time again, he is portrayed as a man of vulnerability, a man who is not immediately chosen by Israel to be the redeemer between the nation and Goliath – a mere shepherd boy and the youngest of his family without the same weight or stature as Saul. And even in the midst of worthless men speaking of stoning him, David’s faith was continually strengthened in the LORD his God. Is this not like us? No – I’m not speaking as if we are like David. Rather, David’s worthless men are like us. Are we not the missionaries who, upon disaster, weep and are greatly distressed only to turn on Christ and abuse Him for leading us thus far? Are we not the mobile church who, after deciding to follow Him as our leader, are led into regions of discomfort where we feel that what we endure is too much to manage? The Spirit at no stage indicates that our lesson is to learn to have the faith of David. Rather, the Spirit is telling us that David is our Christ, in whom we receive the blessings of resurrection and ascension after our deaths for it is His life of faithfulness which has brought all his brethren into the book of life, not our lives of faithfulness. If not for David strengthening himself in the LORD His God, the true king would have died by stoning and the captives of Ziklag would have forever remained slaves of the Amalekites. Yet, our Christ did not give up and once again elected Himself to be the redeemer despite being rejected not only by Israel, not only by the Philistines, but now rejected also by the mobile church of worthless men. David is truly at the bottom of the social rung, of the pit of life, and yet the glory of Christ did shine at its finest peak when he hung on the cross like a worthless worm (Psalm 22:6). And in the midst of the pursuit of the persecutors, we meet an Egyptian slave to an Amalekite. It is here that we see how far Egypt has fallen into other nations’ hands as the nation has not been mentioned since Exodus (at least referred to over one hundred times as a proverb of a nation fallen by the hand of God since the book of Exodus) – and here, for the first time since the travels in the wilderness and Israel’s arrival at Canaan do we meet an Egyptian man. Yet, he is not a prince, nor a master; he is a slave to one of Israel’s enemies. Here, David treats the man hospitably (Deuteronomy 23:7) before asking him about his allegiance (v.12) as it appears that the Egyptian had been wandering in the open country, abandoned and without food for three days and three nights. Is this not what our LORD does for us as he revives us on the third day with true spiritual bread and the waters of the Holy Spirit? Us, who were God’s enemies? Us, who appeared to be the kings of our own world? Us, who in actuality was nothing but slaves and thrown to rot in the wilderness by the allegiances which we make outside of Christ? Yet, David’s love for the man is God’s love for us, His enemies, so that we may no longer betray our true Saviour just as David is this Egyptian’s saviour in the wilderness. For our sickness can only be healed by the true Physician (Luke 5:31), yet our false gods quickly abandon us as they have no true power of healing. Though this man may still call the Amalekite his master (v.15), it is clear that the Egyptian is very much willing to side with David and above all a God-fearing man. Here, from v.16 onwards, we see another prophetic glimpse of Christ’s victory over Satan through the body of the church. Though two hundred stayed at the brook Besor (v.10), four hundred went on to defeat the Amalekites and reclaim all that was lost. This is but a shadow of the judgment day as some Amalekites have fled, just as some of the Nephilim remained even after the flood (Numbers 13:33, as Anakim), but the important message of chapter 30 is the reclamation of what was lost, and even more (as the Amalekites did not only pilfer and burn down Ziklag, but also the great spoil from the land of the Philistines (v.16)). It is under the headship of David that “nothing was missing, whether small or great, sons or daughters, spoil or anything that had been taken. David brought back” (v.19). How this would make the greatest sense in the context of our LORD Jesus Christ who was crucified by worthless men, revived the Gentiles on the third day by feeding us with spiritual bread and water and go on to defeat the enemies of God leading us once again to victory though we are the same people whom he should destroy as well. Indeed, these possessions are all given to us his mobile church, yet it is the flock and herds and livestock which are David’s spoil (v.20), for we the flock are His spoil and not anything which us worthless men can own. In spite of David’s victory, much of the men who went out to fight against the Amalekites were still labeled as “wicked and worthless fellows” (v.22) – and though we, the still-wicked and still-worthless fellows worshipping under the banner of Christ are judgmental of those who had not gone out to reclaim the spoil which the church rightly owns, David speaks the truth behind one of the parables used in the gospels (Matthew 20). The spoils are not determined by the exact nature of our works – for it is God’s economy that he who fights and he who stays by the baggage are equally blessed: the economy of God’s mercy. Just as the small Israelite church had been preserved in the Old Testament (Romans 11), and just as the work of the cross had been prophesied and not yet fulfilled in the time before the incarnation, are these people who stood by the brook Besor denied the blessings of the cross because they have yet to progress into global missions as a theocratic nation? Furthermore, this abundant overflow of blessing is given not only to the fighting men and the tired men but also to the elders of Judah as a gift although David has long been an outcast of Israel – once again displaying David’s love for his enemies as a sign of David’s near-future enthronement as the king of Judah. Though David and his men had not been accepted in both lands claimed by Israel and the surrounding nations, His love for us is to lead us to repentance (Romans 2:4) as he inevitably ascends to become a shadow of the Lion of Judah (Hosea 5:14). 1When Jabin, king of Hazor, heard of this, he(A) sent to Jobab king of Madon, and to the king of Shimron, and to the king of Achshaph, 2and to the kings who were in the northern hill country, and in the(B) Arabah south of(C) Chinneroth, and in the lowland, and(D) in Naphoth-dor on the(E) west, 3to the Canaanites in the east and the west, the Amorites, the Hittites, the Perizzites, and the(F) Jebusites in the hill country, and the(G) Hivites under(H) Hermon in the land of(I) Mizpah. 4And they came out with all their troops, a great horde, in number(J) like the sand that is on the seashore, with very many horses and chariots. 5And all these kings joined their forces and came and encamped together at the waters of Merom to fight against Israel. 6And the LORD said to Joshua,(K) “Do not be afraid of them, for tomorrow at this time I will give over all of them, slain, to Israel. You shall(L) hamstring their horses and burn their(M) chariots with fire.” 7So Joshua and all his warriors came(N) suddenly against them by the waters of Merom and fell upon them. 8And the LORD gave them into the hand of Israel, who struck them and chased them as far as(O) Great Sidon and(P) Misrephoth-maim, and eastward as far as the Valley of(Q) Mizpeh. And they struck them until he left none remaining. 9And Joshua did to them(R) just as the LORD said to him: he hamstrung their horses and burned their chariots with fire. The string of victories which the previous chapter listed is already enough a firstfruit which Israel has tasted. The names of these kings are ironic – Jabin who is intelligent, one whom God observes; king of Hazor, a city called a ‘castle’ – a fortress against all opposition. The king of Shimron, a city of high heights, of ‘guardianship’; the king of Achshaph, a city of ‘fascination’; Naphoth-dor on the west, “uplifting of the dwelling” – these are but a few of the names which these kings are named; which these cities are known as. Yet this is all empty, pure arrogance. Like the wailing of Isaiah 16:7, these wonderful nations shall wail and mourn for themselves as their human richness is utterly destroyed and revealed for what they really are, compared to the true richness stemming from the Trinity through Israel. These empty names are like the tragedy of the Tower of Babylon in Genesis 11 as those nations sought a ‘name’ for themselves, when they could have called upon the name of the LORD. When we saw Christ crucified, he was the man on his knees; when we saw Christ in the garden of Gethsemane, we saw the man on his knees – and this is a huge contrast to Adam in the garden of Eden, who rose up valiantly against God through taking the fruit from the tree of good and evil, standing tall and was ‘like God’ able to judge good and evil. The symbol of Christian strength therefore is not countable by worldly powers, but is other-worldly where He is made strong when we are made weak and meek. The LORD is the only shepherd of the Israelites (Psalm 23:1). That is why in v.6 we see the promise which He makes – “You shall hamstring their horses and burn their chariots with fire”, a phraseology not unlike the commandments in Exodus which all begin with “you shall”. As eschatological as these commandments are, in indicating what we shall be doing in New Creation, it is an indication that the LORD is paving the path for the Israelites so that to hamstring the enemies’ horses and burn their chariots with fire is not a possibility, but almost a triumphant inevitability. The Hebrew word for ‘hamstring’ (עקר akar) can also mean to pluck up or to root up; and this is very important given the context of v.6 talks about the enemy given to Israel as already slain. Therefore, this verse in entirety is displaying the enemies being rendered as utterly useless, to the point where neither horse nor chariot should be of any use to Israel. This in itself is also a duty of humility which the Israelites need to practice (Deuteronomy 17:16), to not own or displace everything which the enemies had possessed – especially these horses which have been used purely for war and are unclean like David’s hands which are unsuitable for the creation of His temple; ironically also unlike the great Solomon who had horded up plenty of horses against His will. Then in v.7 we see Joshua come against them by the waters of the same high place Merom and fell upon them. 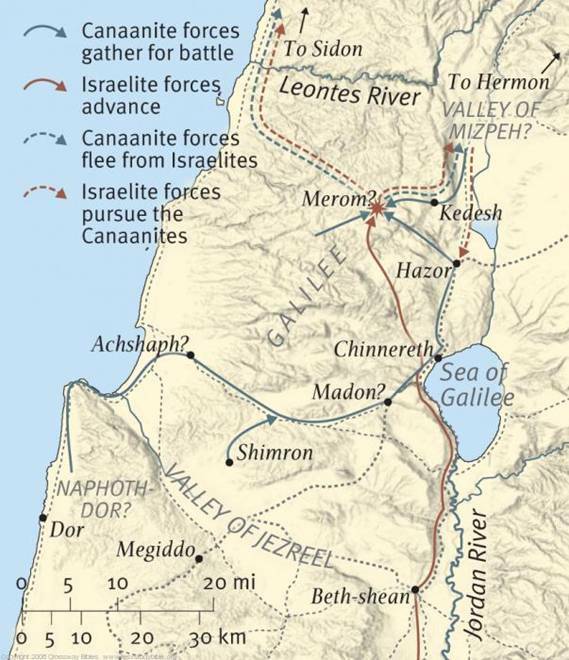 LORD gave them into the hand of Israel, who struck them and chased them as far as Great Sidon (“fishering/hunting”) and Misrephoth-maim (“burnings of water”); eastward as far as the Valley of Mizpeh (“watchtower”), the name of each location complementing context of the situation of Joshua hunting the enemies of Israel by the waters where only two verses ago they had encamped to fight Israel. In this situation where the tables have fully reversed on these Canaanites, we see Joshua fulfilling exactly what the LORD had promised (between v.7-9). It is in this joint act of Joshua’s obedience and the LORD’s promise that we see His glory displayed fully; yet even Joshua could have chosen not to hamstring the horses and burn the chariots, such simple commands which the Israelites tend more than often to compromise. Why oh why will Israel die (Ezekiel 18:31) by succumbing themselves to these worldly pleasures more often than Yeshua’s obedience which typifies that of Christ? 10And Joshua turned back at that time and captured(S) Hazor and struck its king with the sword, for Hazor formerly was the head of all those kingdoms. 11And they struck with the sword all who were in it, devoting them to destruction;[a](T) there was none left that breathed. And he burned Hazor with fire. 12And all the cities of those kings, and all their kings, Joshua captured, and struck them with the edge of the sword, devoting them to destruction,(U) just as Moses the servant of the LORD had commanded. 13But none of the cities that stood on mounds did Israel burn, except Hazor alone; that Joshua burned. 14And all the spoil of these cities and the livestock, the people of Israel took for their plunder. But every man they struck with the edge of the sword until they had destroyed them, and they did not leave any who breathed. 15(V) Just as the LORD had commanded Moses his servant,(W) so Moses commanded Joshua,(X) and so Joshua did. He left nothing undone of all that the LORD had commanded Moses. We then move on to v.10 where Jabin, the king of intelligence who was looked on by God, the king of Hazor, who was the head of all those kingdoms is finally slain by Joshua. Nothing stopped Israel. Their debacle at Ai (Joshua 7) was thankfully early on; by His providence, they experienced such discipline prior to the important battle against Jabin. Thus, only Hazor is burned, to symbolically show that if the head of all these kingdoms has lost and his proud nation burned, then all other enemies will fall. To see Satan fall like lightning (Luke 10:18) is but a foretaste of the fall of all enemies especially on the Day of Resurrection. Unlike the horses and the chariots, the spoil of these cities and the livestock are lifeless and untainted by the blood of war (v.12, 14, 15) and thus Israel, like in every other victory so far, could take their plunder while Yeshua took the breath away from Israel’s enemies. This duty resembling Christ who shall take the Spirit away from all men (not the indwelling Spirit, but the Spirit who keeps a man physically ‘alive’ just as everything in the universe is held-together through Christ – c.f. Genesis 6:3; Psalm 3:5; Colossians 1) when only the believers shall be living forever for we are no longer mortal, but the breath of life shall not dwell forever in Israel’s enemies. 16So Joshua took all that land,(Y) the hill country and all the Negeb and(Z) all the land of Goshen(AA) and the lowland(AB) and the Arabah and the hill country of Israel and its lowland 17(AC) from Mount Halak, which rises toward Seir, as far as(AD) Baal-gad in the Valley of Lebanon below(AE) Mount Hermon. And he captured(AF) all their kings and struck them and put them to death. 18Joshua made war(AG) a long time with all those kings. 19There was not a city that made peace with the people of Israel except(AH) the Hivites, the inhabitants of Gibeon. They took them all in battle. 20For it was the LORD’s doing(AI) to harden their hearts that they should come against Israel in battle, in order that they should be devoted to destruction and should receive no mercy but be destroyed,(AJ) just as the LORD commanded Moses. There is much similarity between Joshua 10:40-42 and Joshua 11:16-20, save a few more details and inclusions which are bolded in the column for chapter 11. It is in these summary lines which we see even more of God’s involvement in helping Israel gain these lands. Although the narration in itself seems to indicate the lightning-pace at which Israel is the victor, v.18 is very honest in saying that the war was made for a long time; and it is only from this macro-perspective that we see the LORD’s faithfulness. If the book of Joshua, like the books of Kings or the books of Chronicles were to hone in on every single battle, every sweat and every sorrow, then we would lose sight of what is being taught here. The book of Joshua is a book of victories, a book of harvest, chronicling the victories of Israel as long as they continue to stand firm with Christ. It is not a silent history of war; it is a proactive commentary of first-fruit, first indicated when a spy like Caleb reported faithfully; and now partially fulfilled through the reaping of the enemies’ possessions, awaiting the true and complete fulfillment in New Creation as the night shadows of the Old Testament come to dawn on the cross, and to full Day on His return. This joy is not only shared within the Israelites, but also shared among the Gibeonites as well (v.19) who were spared and brought into battle on Israel’s side as well; just as Ruth was one of the first to welcome God into Canaan, so Gibeon is now fighting to prove her love for Yahweh, and not only feeding or exploiting the bittersweet covenant between the two nations. It is under this context that v.20 is provided – the LORD does not elect people to reprobation against the contemporary adaptation of Calvin’s doctrine of predestination; v.19 already stated that these Gibeonites chose to side with Israel. These Gibeonites are no different from the Canaanites, save that they are elected through Israel, just as the Gentiles are elected through Christ the true Israel. Why then would the LORD harden only the hearts of the other nations, but not Gibeon? This first mentioning of ‘hardening’ occurred back in Exodus when the Pharoah’s heart was hardened, but not until the latter plagues where the Pharoah was given several opportunities to repent. The hardening of their hearts is but a confirmation of the path which these enemies have consistently chosen to walk, whereupon they would be but pigs before the pearls of the gospel, no longer capable of looking on Jesus with opened eyes but condemned to a stone heart and eternal blindness (c.f. Romans 1:18-32 – the LORD giving people over to their sinful passions). 21And Joshua came at that time and cut off(AK) the Anakim from the hill country, from Hebron, from Debir, from Anab, and from all the hill country of Judah, and from all the hill country of Israel. Joshua devoted them to destruction with their cities. 22There was none of the Anakim left in the land of the people of Israel. Only in Gaza,(AL) in Gath, and in Ashdod did some remain. 23So Joshua took the whole land,(AM) according to all that the LORD had spoken to Moses. (AN) And Joshua gave it for an inheritance to Israel(AO) according to their tribal allotments. And the land had rest from war. Finally, the tribal allotments from v.23 onwards (c.f. Deuteronomy 34:1-2 – the prophecy of the fulfillment of these allotments within Moses’ vision prior to his death) is once more an iteration of the golden time to come, that Israel is now the new ruler of their Promised Land. Indeed, the land finally had rest from war! (1) That Israel has yet to conquer all the lands and enemies until David and Solomon’s time, after which Israel continues to fight and eventually conquered by Assyria and Babylon, which is why there is no true Sabbath rest. Furthermore, the use of שׁקט instead of Sabbath has a subtle implication that the time of the Judges (to come right after Joshua) is not a time of worship, but a time when each shall do as he/she wishes. (2) The true Sabbath rest does not come until New Creation; our Christian life to this day is a spiritual struggle against the prince of the air, and thus we can only experience temporary stillness, though we are warned against idleness because true Sabbath is not ‘rest’ from godly works (Luke 14:3). Ashtaroth and Edrei, ruled over Mount Hermon and Salecah and all Bashan to the boundary of the Geshurites and the Maacathites, and over half of Gilead to the boundary of Sihon (king of Heshbon). The image more or less provides a vaster pictorial presentation of Yeshua’s successful and unstoppable conquest. The boundaries are outlined in Numbers 32, and the displacement of the seven nations (Deuteronomy 7:1) hailing from Canaan the son of Ham in Genesis 10 is recorded explicitly in this chapter (save the Girgashites – mentioned in Joshua 3:10 and Joshua 24:11, it is likely that they were assimilated into the six other nations of Canaan since it is implied that they fought with Israel). Not only this, but the land was truly as fruitful (Joshua 12:8) as Caleb had reported; as various and as beautiful a land could be. This is something which the Israelites have never tasted, from being a small family before Joseph’s time to being a wondrous mixed multitude during the Exodus, to possessing the land of thirty-one kings against their one King and LORD Whom they serve. Adam Clarke indicates that these kings possess small land and allotments in their time compared to the nations today, however I think Joshua 12 is focusing not on the size of the land but the very fact of victory over thirty-one arrogant leaders and the very euphoria of Israel’s 40 years of wilderness nearing the end day by day. 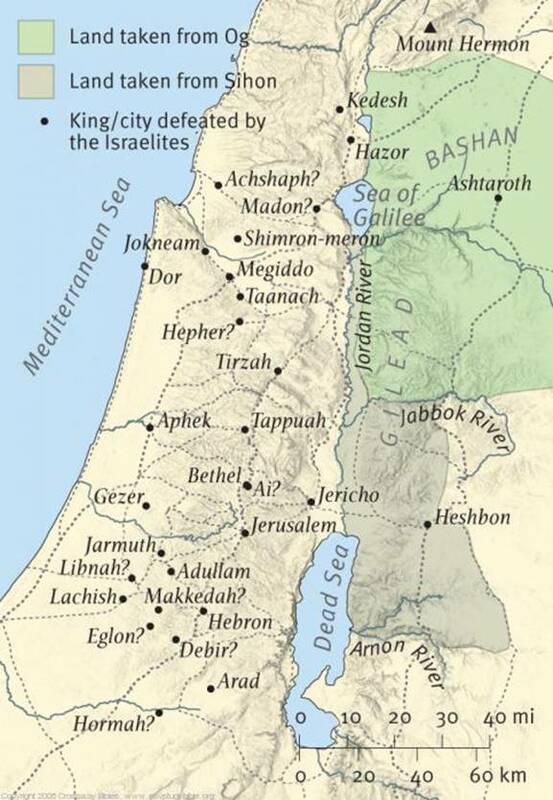 Not only this, but Canaan is a thoroughly pleasing land the moment the Israelites have conquered it; but in present times, as Matthew Henry noted, it is a land riddled with incessant wars, terrorist activities, tainted by all types of heathens and persecutions against Christians by the minute. It is not the true Promised Land but a mere foretaste as Canaan is overshadowed by New Jerusalem. The last bits of Exodus 21:33-36 thus goes on to explain God’s character, and his methods of shattering the idols in our minds by going into the most intricate detail of His law. This includes the detail of opening a pit (in Hebrew “bowr” which means cistern, but commonly used term for prison/dungeon); there is restitution for that as well. We understand that God himself had made a dungeon, his own ‘pit’ where he holds the fallen angels. He himself is responsible for this duty; similarly, if a man opens a pit (v.33) – he needs to be responsible for what goes in or comes out. God is, on a macro-level, in charge of the eternal pit. v.35-36 maintains man’s rule over animals – “if it is known that the ox has been accustomed to gore in the past” – and it is of course up to the man to regulate the animal’s character; and as the animal, as the beast’s master, anything done by the beast shall be repaid by the master, not the beast himself. This is perhaps something quite different from how men restores things for themselves and for their beasts, whereas beasts clearly have no power to repay anything. Exodus 22 begins on an interesting note: if a man steals an ox/sheep, and kills it or sells it, he shall repay five oxen for an ox. Amazing! He is to give back more. Just as Jesus taught the disciples to forgive seventy times seven more, so also the man is taught about grace through restitution. v.3-4 continues this theme of graceful restitution – from selling oneself if the bloodguilt is on the murderer of the thief in broad daylight; to providing double for a stolen possession (v.4); to making restitution from the best in his own field and vineyard (v.5)… full restitution (v.6) if not more is required in many circumstances. Now, the commandments get increasingly mixed up. v.16 refers to a man seducing a non-betrothed virgin/a girl of marryable age, and that he is to give a bride-price for her; or pay money equal to the bride-price for virgins even if her father refuses to let her marry him. This is the better way to do it; not through circumcision as was the tragedy of Simeon and Levi in Genesis! The bride-price is important as it symbolises the man’s responsibility to the woman. For seducing the virgin, it comes with a cost! God does not allow pre-marital relations because it shouts out pre-mature intimacy; in the same way that we have the firstfruit of that intimacy with God by the seal of the Spirit (Eph 1), so also there should be a deposit money equal for the bride-price for such unwarranted intimacy with the Church if the man should treat her as if she is his church. v.18 is strict liability as well – you shall not permit a sorceress to live. Is this a contradiction to the law against murder (commandment 6)? It would, if God did not define the confines of murder; but because he did, the 10 commandments are not statements to be loosely interpreted as to allow paradoxes to arise. This is to directly contrast two points: firstly, that the LORD’s works and miracles are not that of sorcery (let alone of Moses’ sorcery! ); and secondly, that the sorcerers and sorceresses of Egypt deserve death for meddling with dark arts which is an outlet for Satan to bewilder people and distract them from the gospel. God doesn’t want miracles to be adored; he wants miracles to point to Him. Thus, the 10 commandments must be exegetically explained by God himself! We will come back on this in just a sec. v.19 – again, this act of ‘adultery’ shows how a man shall not lie with a non-woman; similarly, a woman shall not lie with a non-man. There is nothing to portray Christ and the Church in either imagery, except to show that Christ is bonding with beast; and Church bonding with beast – this is a clear heresy of subverting the hierarchical chain of God to Man to Beast, to Beast to Man to God. v.20 -26 – this is sculpted by the 1st commandment, because the people of Israel themselves have been mistreated in Egypt; but this is no excuse for them to exact similar revenge on other people – for [the Israelites] were sojourners themselves (v. 21) in Egypt! Why should the Israelites then do the same disgusting thing to the sojourners in their land? God detests such hypocrisy. v.28 – this is charged with the flair of Romans 15 – respecting authority. The command of circumcision, again, bidding [them] always circumcise the children on the eighth day, was a type of the true circumcision, by which we are circumcised from deceit and iniquity through Him who rose from the dead on the first day after the Sabbath, [namely through] our Lord Jesus Christ. For the first day after the Sabbath, remaining the first of all the days, is called, however, the eighth, according to the number of all the days of the cycle, and [yet] remains the first. This displays that the giving of the firstborn, as well as the sign of the circumcision, both serve to provide this imagery of God the Father’s firstborn son being cut and raised again on the 8th day, the first day after the Sabbath; and same for oxen and sheep, for they too are saved (Jonah 3 – the beasts repented as well!). Such is the significance of the 8th day. v.1-3 is almost a reflection of Psalm 24: “Give me clean hands” when this Christological Psalm speaks of Jesus asking for clean hands from His Father in heaven. v.1-9 in general has a heavier judicial undertone, explaining the absolute solemnity of speaking the truth rather than perverting the judicial system (v.6). It is quite clear that our God is just, and he is the one who defines this justice. These are the three memorable days where all the males appear before God. Unsurprisingly, these three festivals mark important dates in Scripture: the year opens with the reminder of Jesus’ death on the cross; followed by the Pentecost in the middle of the year, reminding us of the firstfruits of the Holy Spirit given to all men (Acts 2) which also occured on the Shavuot. This being in the sixth month, on the sixth day, is the mark of man equipped and blessed by the Holy Spirit to spread the gospel, and also to be sanctified (as day six represents that of the creation of man and woman, just as the Spirit is given to all men and women. For six days shall man labour; and so for six days shall we labour with the Holy Spirit for God’s Holy Work of salvation. This is closely followed by the seventh month, symbolising a time of reaping of rewards, the firstfruits of wine and oil, and unlike the Feast of Weeks, this is similar to the Passover, a seven-day celebration. Interestingly, following the Feast of Ingathering there is approximately 5 months before the next Passover… and this contributes to the seasonal cycle of Scripture – through death, comes life, and returns to death again, comes life again. This is no Buddhist samsaric realm (as cherishable as the Buddhist anthropological view is) – rather, this is an observation of our life on earth. Just as we are made from dust, we are given the firstfruits of new life by the Spirit; then we return to dust. But we will rise again, breaking away from all seasons in new creation, and will eternally live in the Feast of Tabernacles where there is eternal wine and oil of gladness, where there is the eternal Tabernacling of the Lamb with us in New Jerusalem. Perhaps there is something more I’d like to note: Three times the male appears. Why? The third festival… relates to the FATHER – whom we will no longer conceive as invisible, but visible when we are given new bodies. v.20-21 speaks of the divine archangel which Philo considered to be God the Father’s chief messenger, and no doubt, Jesus is the Father’s chief and foremost messenger. The Angel of the LORD, who has the name of GOD himself, has the power of pardoning one’s transgressions. The Father tells Moses to relay to the Israelites that this Angel must not be disobeyed (v.22). v.23-24 relates to the essence of all theology – v.24: “you shall not bow down to their gods nor serve them, nor do as they do, but you shall utterly overthrow them and break their pillars in pieces”. Indeed, Christ, the angel, is the one who brings the victory – God the Father is the one who blots them out (v.23), but WE are the ones who decide to destroy the idols according to the victory won. Is faith inactive? Of course not! Let’s not rely on inactive faith, but readily active response to the victory won! Glen has written another great post on faith here. And that fight of faith, by the victory of the cross and the power of the Spirit has explained by the festivals, shall result in the symbolic treasures of Canaan. The land will be enlarged, the people will no longer be barren… but v.33 ends on a sombre note: “They shall not dwell in your land, lest they make you sin against me; for if you serve their gods, it will surely be a snare to you.” So that is the truth – STRAIGHT after Moses speaks to the Father, Israel is already serving their self-made calf. Will the Israelites ever inherit such blessings? Surely God knows they won’t if they relied on themselves: look at what happened with the quail and manna and water, and their inability to not whine. The irony of Exodus 24v.3: “And all the people answered with one voice and said, ‘All the words that the LORD has spoken we will do. '” The immediate hypocrisy. Clearly, the only way one can even do any of those things completely is in Jesus Christ alone. What is the meaning of the law? It is to explain that Christ alone can do these things. What is the meaning of the law? It is to explain God’s character, and the character of the Seed God-man. What is the meaning of the law? To display how utterly fallen we are, and our utter incapability of fulfilling it by ourselves, except in Christ alone. Yet, if we understand the law, and keep the covenant undefiled by the power of the Spirit, then we will truly inherit the spiritual truths behind the blessings of v. 23-32. (b) This is the reason why it is difficult to separate one law from another, to purely classify one as a law concerning ‘adultery’ and another concerning ‘theft’. The analysis above shows that God intentionally mixes the commandments together to show that they are all undergirded by the first two truths, and cannot be pedantically analysed in themselves. (d) Noticeably, this justice system is one of mediation: Exodus 21:22, and 22:8 are the more obvious examples. There is no indication that one is to strive for restitution by themselves, and there is in some sense a mediator between two parties. Restitution is still followed, and the punishment normally matches the crime, but where an intended crime is committed, the punishment is even greater (Exodus 22:1). God therefore doesn’t look on the physical act, but on the heart of the person. This system of mediation however teaches us that we do not strive for justice alone; but we need a third person for objectivity: which also means that as Christians, until the Judge comes to provide justice, we fully understand that restitution is owed to Christ when we offend him. And any non-Christian offending us, who are in Christ, is effectively offending Christ himself. We’ll leave it at that, until we come to the new covenant… which is not mentioned of course only in the New Testament. The new covenant will come around as soon as Moses shatters the tablets of the law and the commandment, and the new tablets have slight alterations which really aren’t so slight. Such is the blood of Christ that has been thrown on us to redeem us and to cleanse us of our sins. The Israelites are not ignorant of this imagery, as already shown by the blood on the lentils and the doorposts in Egypt. 9Then Moses and Aaron, Nadab, and Abihu, and(DF) seventy of the elders of Israel(DG) went up, 10and they(DH) saw the God of Israel. There was under his feet as it were a pavement of(DI) sapphire stone, like the very heaven for clearness. 11And he did not lay his hand on the chief men of the people of Israel; they beheld God, and(DJ) ate and drank. What an amazing and humbling picture this is. The seventy elders, Nadab, Abihu (the oldest and second oldest son of Aaron), Aaron and Moses went up to the mountain of God and effectively SAW God. Remember John 1:18 – no one has revealed the Unseen God except for the seen God Christ himself. They saw the sapphire stone, the throne in heaven! (Ezekiel 1:26, 10:1). They ate and drank before JESUS! This is truly prophetic of what we will be doing with God in New Jerusalem, that we will be eating and drinking with Him at the wedding feast (Matthew 22). And what a fitting time it is to establish this wedding feast, when the wedding vow was entered between God and the Israelites (when Moses read the Covenant out to the Israelites, whereupon they responded in Exodus 24:3) – and after the wedding vow of course comes the wedding feast on the holy hill. Finally, the LORD tells Moses to seek him after six days of the cloud covering the mountain (v.15), and going in on the seventh day (v.16); Moses lasted there for forty days and forty nights neither eating bread nor drinking water (Genesis 7:12; Numbers 13:15; Deuteronomy 9:9; Jonah 3:4; Mark 1:13). This pattern of forty-days and forty-nights is not only seen as a time of testing, but it is seen as also a time of anticipation – and either victory or destruction results from these forty days and forty nights. Indeed – will Israel be judged for their obedience in Christ? Or will Israel turn away and worship other gods? Will Jesus ascend to the higher throne, the holy hill? Or will he buckle to Satan’s temptation by just the bow of His knee? Perhaps an important though small detail to note. Moses chose Joshua as his assistant (Exodus 24:13). Joshua who later conquers Canaan. Joshua who won against the Amalekites. Joshua who later meets the Angel of the LORD. Joshua, whose name was given by Moses (previously it was Hoshea) at the Conquest of Canaan. Joshua, whose Hebrew name is Yeshua.